“Ever since I was old enough to fold my hands and close my eyes, I’ve said prayers to God, answered ‘Jesus’ to all the children’s sermons questions, celebrated Easter and Jesus’s resurrection, believed that God would take care of me. But now, I wonder . . .” One or more of your students at some time, if they feel safe from any hint of judgment or of being misunderstood, may have hesitantly expressed this attitude to you, in class or in personal conversation. 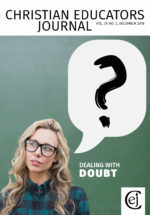 They may only be testing themselves as one of the experiences associated with growing up: “What does saying ‘I doubt’ feel like? Can we talk about it?” Belief is not really in danger; there is little real doubt that God and God’s salvation exist. Sometimes, however, for us as well as for our students, the questions go deep. Someone we are close to dies, perhaps at a young age. Or someone we know suffers from leukemia or multiple sclerosis or an automobile accident. Or we are deep in a friendless depression, ignored, cyberbullied, alone. Or perhaps we are consumed by an intensely nagging thought that God is alive but doesn’t care in any form about us. Really, does God exist? Does God care? Such a condition led David and even Jesus to cry out, “My God, my God, why have you forsaken me? . . . I cry by day, and you do not answer” (Ps. 22: 2, 3). Grace is no longer cheap; the search for it has become costly. Novelists who have been brought up in the Christian tradition often put their characters through this school of costly grace, reflecting in various degrees and with varying results their own struggles with faith and doubt. Given the distance the sensitive reader has from what is in the pages of the novel, she is able to sort out varying characteristics of the issues at stake, in the reader’s world as well as in the narrative’s world. Two novels that create worlds where the main characters are engaged in conscious, and conscientious, spiritual struggles are Graham Greene’s The Power and the Glory and Peter De Vries’s The Blood of the Lamb. In these novels, where fallen worlds are dominated by dying and death, the struggles are realistic, not romanticized, ones: the toothaches are real, the hypodermic needle punctures are painful, the coffee is bitter, the losses are devastating, psychologically and spiritually. The job of a good novel is to make a situation particular, and after we have walked around in these worlds—dirty, sweaty, fallen, but not without moments of power and glory—perhaps we can come out of them more understanding, more accepting, more firmly believing. And perhaps more able to minister to others, such as our students. So what can we experience in the worlds of Greene and De Vries that can enable us to interrelate with our students up against a lonely world, possibly depressing, possibly frightening, potentially perceived as foundationless, and ungraced with belief?